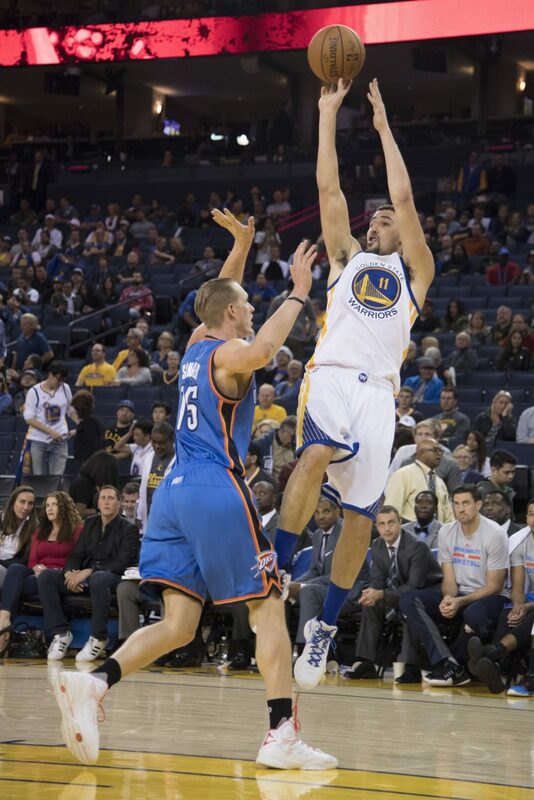 The Golden State Warriors are the perfect millennial basketball team. They see everything. They read everything. They’re petty as all hell. Then they’ll come out, destroy you, and taunt you right in your face. All about it. They’re made for this generation of fans. Older generations of fans and media project class, hard work, and some false sense of righteousness upon the athletes they cover. Perhaps that’s been the case, perhaps not. This team doesn’t pretend to be who they aren’t. They get the smallest things get to them. They let LeBron James’ trolling get under their skin. Huge atmospheres and moments affect them and they go for the haymaker when any other play is more effective. They’re human beings, like you and I, and they don’t strive to act any other way. They aren’t villains. They’re just sick of the faux self-righteous slander from all sides and the only ones willing to admit they see it. 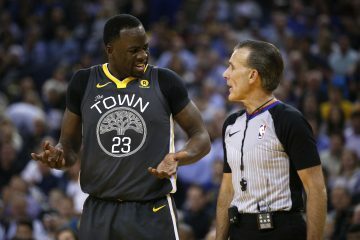 So in Thursday night’s 122-96 massacre of Kevin Durant’s old team, the Warriors deferred and let him do the talking, to the tune of 39 points in 31 minutes. All offseason, the Durant caught flak from OKC fans, their media taking potshots, and even his ex-teammates that tweeted criticism from a soapbox. So Stephen Curry, Klay Thompson, and Draymond Green took a step back, and let Durant do all the snapback necessary. It started without a handshake. It built up with exchanged blocks from Russ and KD. Then it started with a 3 here, one more there, an emphatic dunk out of nowhere. By the end of the onslaught the Thunder were nothing more but the distant memory Durant has been trying to make them since the offseason. This doesn’t stop the complaints. It certainly won’t even come close to stemming the hate from KD’s harshest critics. 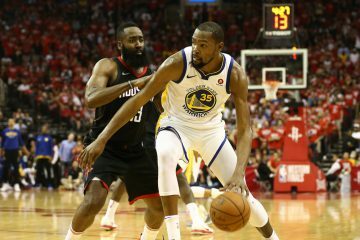 This game does but reinforce the notion that Durant teaming up with the Warriors will only make the rest of the NBA a foregone conclusion rather than a suspenseful chain of events. Each block felt harsher than the other, each pull-up 3 more cruel than the next. 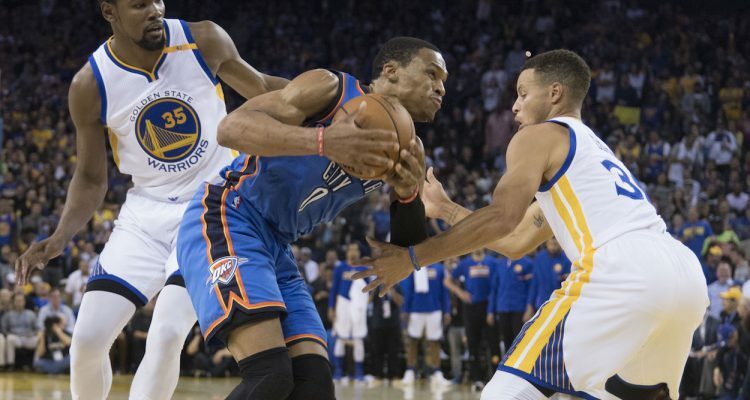 By the third quarter, the Warriors were playing to the crowd, and to their emotions. 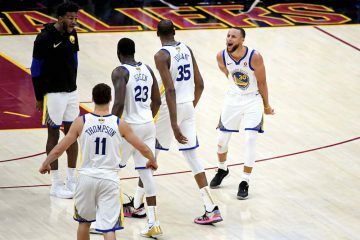 Up 30, Curry, Thompson, and Durant spent the entire time tossing out haymakers, playing to the crowd, and fiending for the irresistible comfort of cockiness. At the end of the game, Durant simply stated, “If you start it, I’ll finish it.” Make no mistake, Enes Kanter’s words were noted. 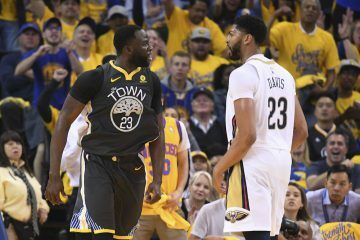 The rest of the league, their ex-players, and the entire masses the Warriors believe are out to get them, they believe they can put them on notice. It doesn’t matter whether it’s true. Each hyper-competitive athlete will find anything or everything to belittle themselves in the eyes of their beholder. The Warriors, despite already owning a ring, the greatest regular season in history, still somehow believe that they’re underestimated in the lens of the people that matter. To Paul Pierce, Charles Barkley, and anyone that dares throw out the slightest sideways comment. These Golden State Warriors hear it all. They go out of their way to listen to it all. And perhaps it’s unbecoming to those that believe athletes should be above us, act morally unreasonable, and stroke the perfect figure they praise to. This team is not. And they’re going to try to win in dominant fashion, taunt, and have fun in the only way even the most normal human beings can understand. And Kevin Durant got to have a taste of that sweet revenge against his former team.